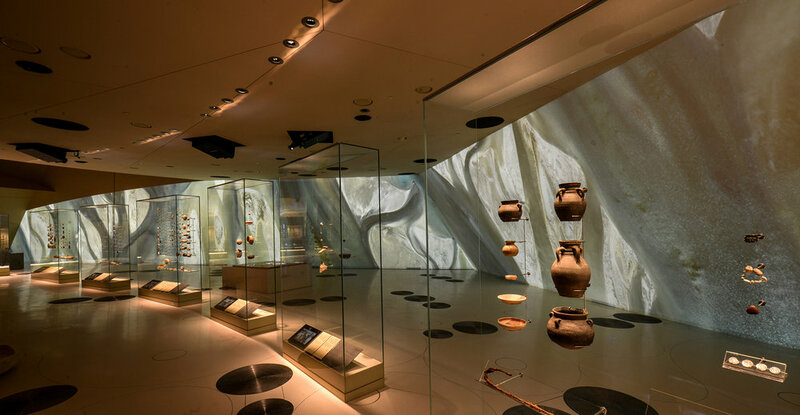 QATAR – Qatar’s remarkable new National Museum launched in spectacular style at the end of March, offering visitors an immersive and experiential journey through the country’s rich history, current identity and aspirations for the future. Much of its 430,000 sq.ft. of indoor space is made up of cinematic display zones, onto which specially-created film content is projected. The result is the world’s biggest ever permanent video installation – the result of a collaboration between RES, the Doha Film Institute (DFI) and MAN Enterprise / EMPTY Joint Venture. London-based visual technologists, RES, started work on the project in 2014, providing technical consultancy and video media system expertise to the DFI on technical realisation and pre-visualisation of each film. 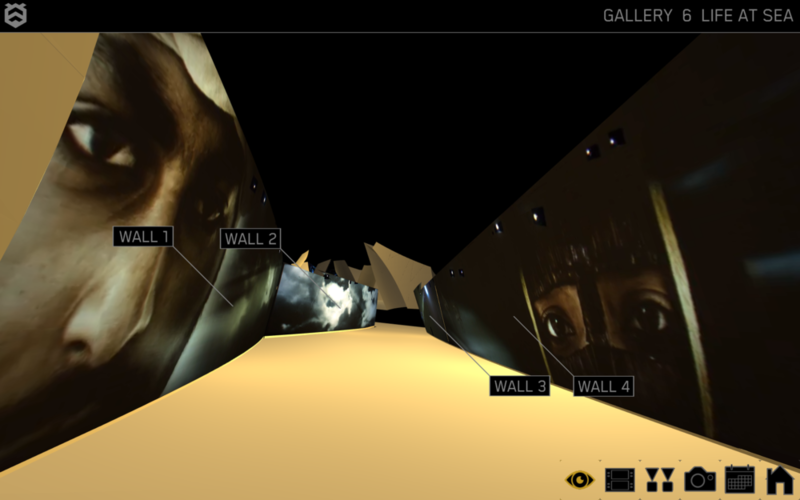 As part of its ambitious ‘Art Film’ project, the DFI commissioned nine filmmakers to produce content about Doha’s culture and history, which would be projection mapped in high-resolution onto the museum’s internal surfaces, every day from launch. The Art Films in each gallery create an immersive audio-visual experience of each subject, bringing to life the narratives of the collections on display in extraordinary, beautiful and innovative ways. The video project is on a vast scale. RES estimates that 21,000,000,000 [21 billion] pixels are processed each second, by 172 media servers driving 112 Panasonic 4K projectors. More than one petabyte of media is stored and on playback, the data fed by 50.6km of 3G SDI cabling. Each video requires full motion image resolution as high as 25K by 4K, to cover more than 33,000 sq.ft. One of the biggest challenges was the sheer quantity of AV equipment, all of which needed to work together in perfect synchronicity. To address this, HIVE Media Control Ltd - a new UK company formed by RES and Harrison Digital Media Inc. - designed a new, bespoke software package called HIVE. HIVE controls and monitors all the Art Films systems site-wide and facilitates simple, intuitive operation of the highly complex system. HIVE ensures that the operational support and ongoing maintenance is convenient and efficient through a web browser based user interface with live video streams rendered into the site geometry, overlaid with operational UI for control & monitoring. “Pretty much everything RES did was the right solution,” says Winkler, “but perhaps most noteworthy was their ability to take the existing highly complex architectural designs, with little free ceiling space, and figure out how to integrate 112 4K Panasonicprojectors to meet the exacting technical specifications of the project. “Working alongside Mark and Dave, we began testing equipment that we believed could address the technical challenges faced in positioning projection equipment to provide the large scale, high quality images required,” explains Day. “This project has been a hugely significant for Panasonic, being the largest single rollout of the PT-RQ13 4k+ projector globally. The success of the RES and Panasonic equipment has been the ability to reproduce images of outstanding quality from the shortest viewing distances, and with the flexibility to position the projectors as unobtrusively as possible. 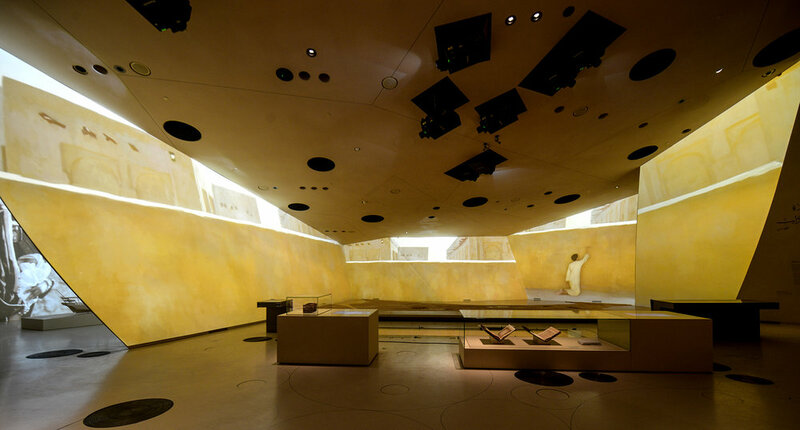 Designed by architect Jean Nouvel, the National Museum of Qatar is located on a 1.5 million sq.ft site surrounding the existing Fariq Al Salatah Palace, which had served as a museum of heritage since 1975. The building consists of a ring of interlocking display zones, encircling a large central courtyard area. Its design is inspired by the famous phenomenon of the ‘desert rose’: crystalline forms, like miniature architectural events, that emerge from the ground through the work of wind, salt water, and sand.